Eklavya was a tribal boy who wanted to learn to be a good archer. Acharya Drona, the royal teacher refused to teach him. Eklavya made a clay statue of Drona. Every day he practiced in front of the statue and soon became a good archer. One day, when Eklavya was practicing, a dog started barking. He shot many arrows in its mouth. But he did it in such a manner that not a drop of blood came out. Drone, who was nearby, saw this and was impressed. He was sure that only a great archer could do that. He started searching for the archer and found Eklavya practicing nearby. Drone went up to him and asked him, "Who is your teacher?" Eklavya answered "You are my teacher," and showed him the statue. Drone said , "Give me your right thumb as my fees." 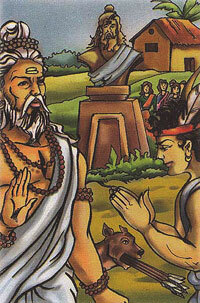 Eklavya knew that without his right thumb he could not shoot, but he cut off his right thumb and gave it to his teacher.